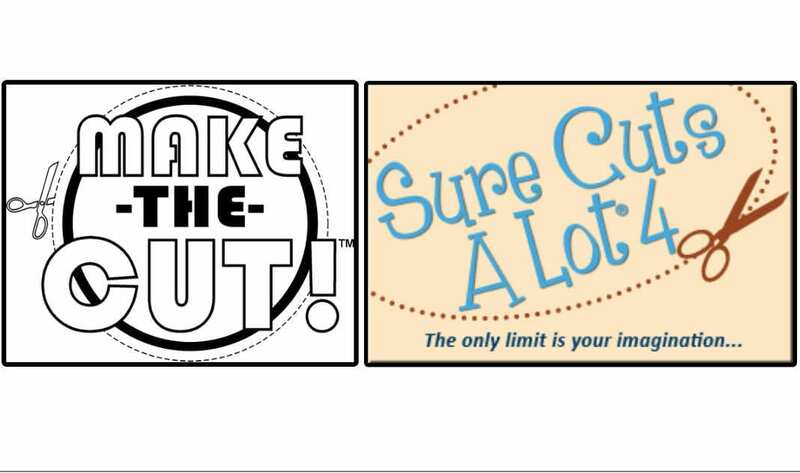 Make the Cut and Sure Cuts A Lot are two popular choices for designing and cutting files to digital die cutters. In the past year, I’ve been frequently asked which better. The answer is, “They’re both good programs, similar to one another with different strengths and weakness. So it depends on what you need.” Thus, it’s important for customers to understand the differences so that they can pick which one is best for them. I recently published a post at Personal Die Cutting which outlines these strengths and weaknesses, listing the assets of each program in various areas, such as text, designing, user interface, cutting, etc. I urge you to read this article in order to understand what the two programs offer and where they are lacking. I then came up with the idea of a checklist for users based on their specific needs and planned applications. The lack of a smiley face doesn’t necessarily mean the program is incapable of handling that particular function. It just means that the other program is better suited. I own a Mac ☺ ☺ The MTC version for a Mac, which runs via a Wine emulator, has restrictions: cannot change printer settings, only cuts to a few types of cutters, requires tweaking a throttle setting to prevent stops during cuts. I prefer to work in metric units ☺ ☺ SCAL’s options are mm, cm, and inches. MTC main display, including the virtual mat is only in inches. You can enter settings in metric units, but the main display is always in inches. I cut lots of different materials ☺ ☺ SCAL offers the ability to add presets for storing settings on both materials and blades. I design and cut stencils ☺ ☺ ☺ SCAL has a Stencil Bridge function for easily connecting child shapes to the outside area. In MTC, one can use the Erase tool. I design and cut rhinestone templates ☺ ☺ MTC comes to a crawl if editing rhinestone patterns with more than a few hundred circles. I design and cut HTV projects ☺ ☺ SCAL has a Knockout function for quicker designing of projects where layers cannot overlap. I cut small designs from vinyl ☺ ☺ ☺ SCAL4 Pro has cut by color and the ability to assign a layer to cut with every color and be used for aligment. I cut large designs from vinyl ☺ ☺ Regular SCAL4 is limited to 72″ long cuts and there is no tiling option. You would need either MTC or SCAL Pro for these capabilities. I do print and cut applications ☺ ☺ In SCAL layers can be assigned as Print-Only or Cut-Only. SCAL also offers customizable registration marks and Scan to Cut for some cutters. I design and do engraving patterns ☺ ☺ SCAL has a Line/Hatch Fill option for filling in shapes. I draw with pens in the cutter ☺ ☺ SCAL has a Line/Hatch Fill option for filling in shapes. It also has a prompt option to allow tool changeout, if needed. I prefer to design my own files ☺ ☺ ☺ Both programs have excellent designing capabilities. I prefer to buy cutting files or find free ones ☺ ☺ ☺ Both programs import a wide range of file formats. I design in KNK Studio ☺ You can copy/paste directly from KNK Studio into MTC. Using SCAL means you’ll need to export as AI, EPS, or PDF from KNK Studio and then import. I design in Inkscape ☺ You can copy/paste directly from Inkscape into MTC. Using SCAL means you’ll need to save as SVG in In kscape and then import. I also made a printable version of this table. Further, you can check out the user manuals for either program by visiting the Zing Air user manual page. The software part begins with Chapter 3. Please feel free to post any questions you might have about these programs! I’m always happy to answer.